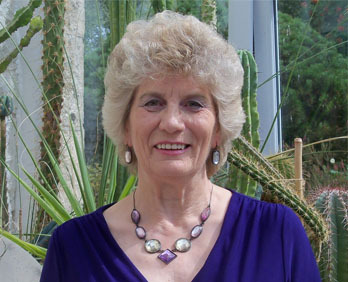 Hello, I’m JuneMary and my passion is helping people to Live Clean and enjoy a longer, healthier life. 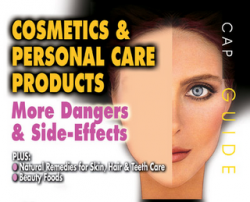 One major stumbling block to a healthy life is the many harmful and questionable chemicals in products we use on a daily basis, such as Bathroom products, as is shown by research dating as far back as 1989 when the US Dept of Occupational Safety and Health analysed 2,983 chemicals used in personal care products such as toothpaste, bubble bath, cosmetics etc. Experiences like … never feeling 100%, being tired all the time, always catching something, not sleeping properly, indigestion, skin problems … are early indications that the body is under attack! My improved health shows that by adopting the Live Clean philosophy, we can change this so come with me on this journey of Renewed Health by joining my Renewed Health Community on FB and see how you too could have the benefits we all want. Why We Must Ensure That We Have The Right Bacteria In Our Gut And How We Can Acquire Them. The following information is supplied by Dr Natasha Campbell-McBride, a medical doctor with post graduate degrees in neurology and nutrition. She is the founder and senior partner of the Cambridge Nutrition Clinic, specialising in digestion and immune system disorders in adults and children. Her work has achieved international acclaim with lectures in Europe, the United States and Australia and the publication of her book ‘Gut and Psychology Syndrome’. She has pioneered the development and use of probiotics and is responsible for the formulation of the Modere Advanced ProBiotic “Protozymes”. We know we have bacteria inside our digestive tract – an adult on average carries 2k of bacteria and there are actually more cells, more genetic material, in our digestive system than in our entire body. They are a highly important part of our human physiology that we cannot live without. The number of functions that our gut flora fulfils play so many vital roles not just in the digestive tract but in the rest of the body. Here are just a few of the most important functions. The whole surface of the digestive system is covered by bacteria and if these bacteria are the right ones, the beneficial bacteria, if they predominate there (ratio 80:20), then they become the housekeepers of our digestive system; they are our protectors from all sorts of invaders, bacteria, parasites, fungi, toxins that come with food and drink and enter our digestive system all the time. At the same time they convert the food that comes along into a whole host of nourishing substances for the gut lining itself, orchestrating the whole cell regeneration process in the gut wall. Cells that line the gut only live a few days; they are born, fulfil their function then die. If the beneficial bacteria are not there, this process goes wrong; the cells mutate, the cells change so that they cannot fulfil their function of the digestion and absorption of food and they can turn cancerous. If you have a good level of beneficial bacteria in your digestive system, they will stop any cancer formation because these 2 things, cancer and good solid gut flora, cannot live together. Besides ensuring that the gut is in a good shape to digest and absorb our food, the beneficial bacteria in our gut actively take part in digestion and absorption by producing every enzyme under the sun for digesting proteins, carbohydrates and fats and they produce substances that transport nutrition through the gut wall into your blood stream. 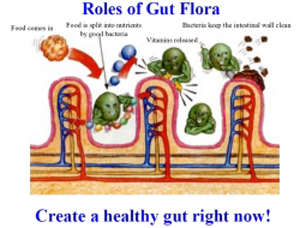 That is why people who have damaged gut flora, or gut flora which is not at an optimum, cannot digest and absorb a lot of food or supplements and so much of it simply passes straight through the body and out! because most of the substances are water soluble and don’t stay in the body long, so even if we have plenty of them in our food and have supplements that provide us with them, there will be times during the day when we will be deficient in these substances. Nature has always found a perfect solution to this problem – provided us with our own little factory, our digestive system which constantly produces these substances and constantly releases them into our blood stream to provide us with these substances, every second, every moment, every day of our life. Our gut flora plays a major part in detoxofication. Beneficial bacteria can collect pretty much anything – aluminium, lead, mercury from amalgam fillings, or vaccinations in children, chemicals in foods, flame retardants from our carpets, paint from our doors, anything that gets into our digestive tract and any sort of carcinogen produced as by products of the normal digestive process. Beneficial bacteria will grab them, collate them, neutralise most of them and they will remove them from our body. So having solid gut flora is very important to protect ourselves from these things. Having the right bacteria inhabiting our gut is not only desirable but vital! 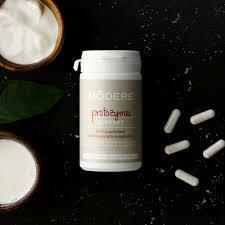 Why do I believe the best pro-biotic supplement is Protozymes?? Since 2003 there have been large numbers of clinical trials on probiotics (77 in 2004 alone). 800 strains have been identified, 400 of which have been closely studied and numbered 1 to 400 , number 1 being the most beneficial to our health. 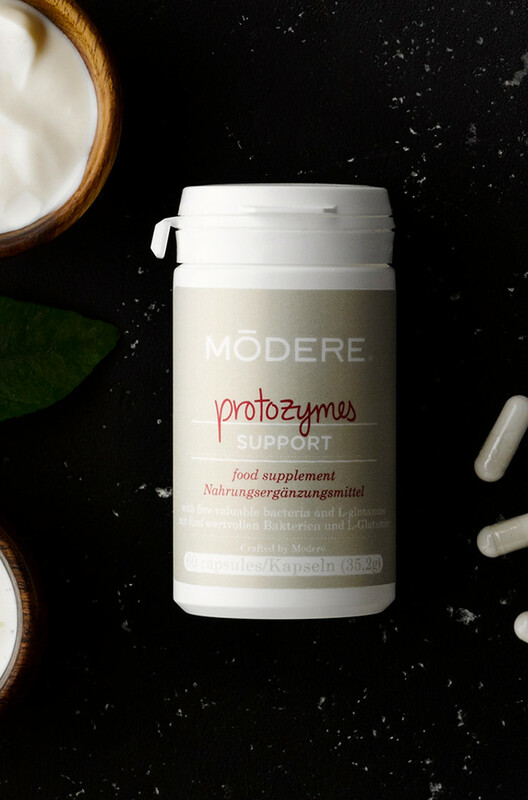 Dr. Campbell-McBride chose numbers 1 to 5 for her Advanced ProBiotic “Protozymes” and added Saccharomyces Boulardii, the probiotic yeast which kills the pathogenic yeast Candida Albicans (Thrush). I don’t know of another probiotic supplement which can kill Candida. A gut full of Candida kills us. Protozymes is a very powerful formula. and listen to how to use them for specific purposes in Dr. Campbell-McBride’s talk in the “AUDIOS” section.